You can’t turn around these days without tripping over a nutrition expert extolling the virtues of bone broth. Guilty as charged. I have been suggesting bone broth to clients with everything from IBD to arthritis to breast cancer, and to entire groups of busy, nursing mothers. Heck, it even makes a great body booster for my athletic sons. Is bone broth truly a revolutionary superfood or just the nutrition-obsessed flavour of the month? I’ve always known bone broth to be the ideal supplement for nourishing, well, your bones. It’s one of Nature’s calcium supplements, balanced along with ALL the minerals and protein your bones need. By steeping all the nutrients from one set of bones into liquid, they’re easily assimilated to support yours. chondroitin (reduces inflammation & improves joint function). electrolytes, including a highly absorbable form of potassium (regulates heart rate, blood pressure & nerve impulses). Bone broth has being touted as the cure for leaky gut and dysbiosis. It calms inflammation and detoxifies your digestive tract. It nourishes you when you’re pregnant; it rejuvenates you when you’re ill.
My goodness, bone broth really is a super food! Now, you might know me enough to realize that my trust in bone broth goes much deeper than those wonderful physical benefits. This isn’t coincidence. These foods developed from very basic human practices: ancient traditions that use every last piece of the animal they killed. Not the “yucky” parts we modern Westerners tend to throw away, bones and cartilage and fat and organs are the gold! Think about it: your structure and your organs are a core part of you, the most essential, so it stands to reason that they should be storehouses for your most essential nutrients. Maybe it was the fat scare in the late 20th century that turned us off these good bits. Maybe it was growing awareness of environmental toxicity that compelled us to chuck the skin and the liver. Then, we became overly concerned with building muscle, which somehow translated to a need to eat more muscle, aka lean meat. Over the last few decades, our focus shifted from enjoying the whole animal, to only wanting boneless breasts and tenderloin. The return to whole food seems radical, but it’s just a natural return of the pendulum after so many years feeding ourselves refined, partial foods and non-foods. Some items obviously need peeling or gentle cooking, but the goal is to eat food as closely to how it grows in Nature. All of it – the seeds, the pith, the leaves, the roots – not just the starch and the sugars. Whole food is not just about plants, either. Eating whole food also means eating an entire animal. Ok, you might not eat an entire cow at one meal, but a family of 4 or 6 through a year…sure! Eating the whole animal means getting what you can out of the gristle, the gizzards and the bone, not just the “meat”. It’s not just the what of bone broth, but the how. We city-dwellers also like the convenience of cooking lean, boneless meat. Nothing to trim or clean; just pop it on the grill or in the pan and voila! healthy fast food at home. We live fast, we eat fast, we want our meals to be ready fast. I can’t tell you how many women in my office tell me they don’t have time to make healthy meals. At the risk of sounding like my mother, Rome wasn’t built in a day. To have anything of quality – a solid house, a well-made dress or a healthy body – is not something that appears fully-formed overnight. Quality takes time and effort and persistence. Your body regenerates completely every 7 years. Which means that it could take that amount of time to shift your health fully. There is no magic bullet – no herb, no superfood, no drug – that will cure you tomorrow. You’re in the driver’s seat of your own healing with the choices you make, the food you eat, the thoughts you think, the feelings you express and words you speak. All that you receive into your body and that you emit from your being form the dynamic creation of your health. It’s a wave, a pulse, an ever-shifting breath. It is eternal. Health takes time. Wait…scratch that…it’s timeless. When you feed your body with such “slow” food as bone broth, you are infusing the water, not only with nutrients, you are accessing the health and energy of the animal, of the plants he ate, and of the plants you’ve added to the pot. Having a crock-pot on the go for a day or two harks back to the kettle on the fire, the hearth of the family home, the core of the community. It’s the women around the fire-pit, tending, caring, nurturing. You’re heating the house and nourishing your family with nothing less than basic nutrition. Boiled down to its essence, you’re feeding your family with love. Nothing fancy or difficult about it, either. Same method your grandmother used: bones and veggies covered in water, with the addition of some vinegar to draw out the minerals and break down the protein. Let it simmer ever so gently for a good long time (3-4 hours for fish, 24 for poultry or up to 48 for beef). Want a more specific recipe? Try this one from the inimitable Sara Bradford. If truly time is of concern to you, why not engage some of that community spirit to your benefit? Get a couple of friends to start bone broth sharing: everyone collects their organic bones and veggie scraps in the freezer, then each month, one of you tends the fire. You can even make a party of everyone coming by with their jars for their share of the wealth. Perhaps my ideas are bit too far out in left field for you. Then, look at it this way: taking the time to make your own bone broth is a way of slowing down, of taking a breath in the middle of your go-getter life. 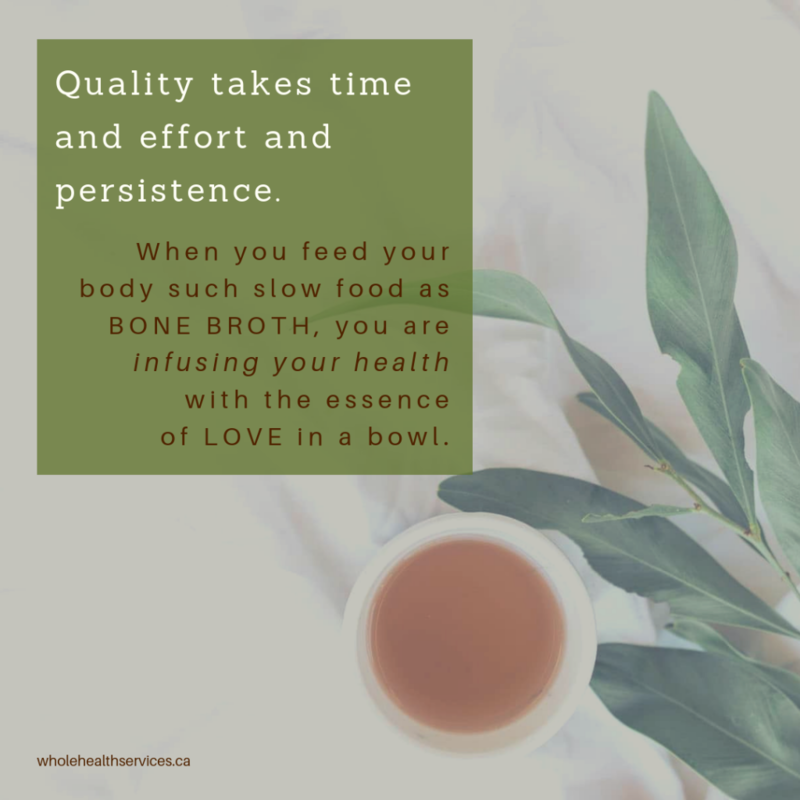 See the effort of bone broth as an act of self-care, an act of self-love, to supply yourself and your family with the most exquisite nourishment you can offer. There are countless recipes out there for how to make and use bone broth – what’s your favourite? When you share in the comments, you open possibilities for others. Have a friend looking to improve her health and digestion? Send her this post by using any (or all!) of the pretty green buttons. This entry was posted in Creating Health from the Inside Out and tagged bone broth, foundations of health, healthy food choices, nourish your body, protein, reduce inflammation, self love by Cathy Cochrane. Bookmark the permalink. i don’t really like spending time in the kitchen, although my family does eat well. “bone soup” is something i grew up with – my mom always made it after we had chicken. but i’ve never gotten around to simmering a pot myself. your post brings back delicious memories of soothing comfort. and the health benefits you’ve listed are phenomenal! i think the moment may have come . . .
Never hurts to try… fond memories definitely help. Have fun with it! Cathy I’m intrigued! I have indeed seen many posts raving about bone broth but never paid much attention as I prefer not to eat mean. Having said that, due to my health (Dr says IBS, homeopath says Candida) I have began to introduce some animal protein, little by little. Perhaps I should look into this more deeply, can you recommend a simple recipe for a beginner? I DO have a crock pot. Do you think this will help my digestive problems? Does it fill you up or do you eat something else with it… I actually have so many questions!! Regardless of what the actual diagnosis is, Angela, bone broth contains very easily assimilated nutrients that will support your digestive tract. In fact, it’s the gentlest way to reintroduce a bit of animal food back into your life, if that’s what you decide to do. As with any broth, you can use it for cooking grains, as a base for soups, stews, sauces, as well as a nice alternative for those times that cry for Ovaltine or Bovril. Have I told you recently just how much I love you? Ohhhhh to read this, makes me feel like I’ve come home. I cook bone broth as a regular part of my nourishment… the energy from the animal also is very good for us… and goes so deep… and the image of the woman around the fire, nourishing and feeding the family, gives a whole new meaning to being around our contemporary stoves! For some reason, that spoke tome differently today… in the contemporary form… So beautiful to bring in the ancestors ways into our modern life, and make meaning. Incidentally, I just finished 3 days of eating not much more than simple soups and fresh vegetables. Though I hadn’t planned on doing a cleanse, it turned into one – got rid of some of the winter bloat and some digestive symptoms that were threatening to take over again. The best part is that I came out of it feeling grounded in my energy – as opposed to the more flighty way I feel after a solely plant-based detox. And no sense of deprivation whatsoever. i’d love to hear what you ate during the 3 days, cathy. i’ve been experiencing a few “off” symptoms. this sounds like a nice gentle way to ease them. April, it was nothing formal, or planned out – mostly just soup – turkey soup I’d made with the bone after roasting a breast – 3 times a day for 2 days. Herbal tea and water too. There was a bit of meat and some vegetables in it already – to vary I added things like fresh herbs, avocado, rice one day, quinoa the next. The 3rd day I drank straight bone broth (I’d had some in the freezer) and smoothies (avocado, fruit, coconut milk and herbs), and ate cooked veg (broccoli, asparagus, salad… whatever was on the go for everyone else). When it was over, I made a big pot of brown rice with more bone broth, that I ate with every meal for a couple of days. The general idea was to eat a super simple diet and give my GI tract a break from too much food, to have energy to sort out the inflammation. What a gift, to have so much tradition steeped into the kitchens of your roots. Which brings up another thought I could elaborated above: our bones as our roots…on so many levels.